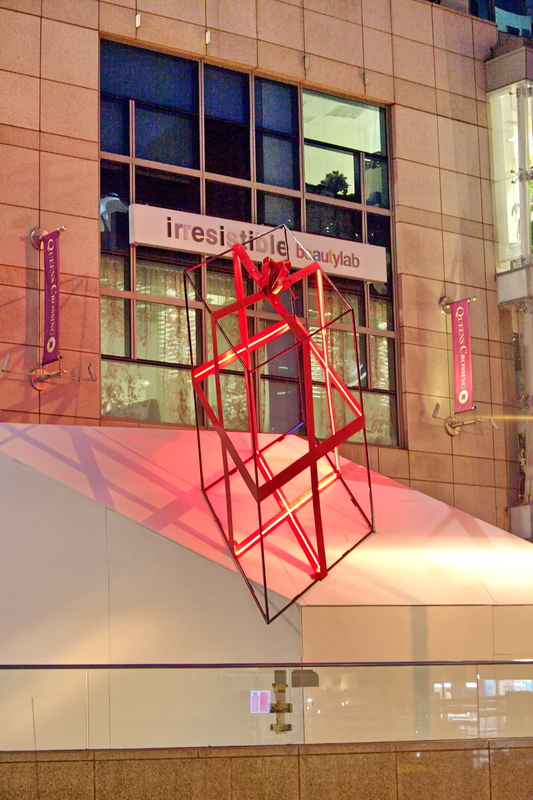 “The Gift” is a temporary sculpture designed by Leon Reid IV. The work is a geometric play on the traditional gift box. The gift, with its varying perspectives, serves as a metaphor to encourage the viewer to think about the act of giving, which is synonymous with the holiday season. We wish to inspire community connections this winter and invite passersby to use this sculpture as a way to share the warmth of the holiday season with friends and families. In addition to giving physical gifts this year, the artist and Queens Crossing, encourage the community to give the gift of time, compassion and love to family, friends, and strangers. In our busy world, full of technology, it is easy to simultaneously connect and disconnect with those around us. Queens Crossing wishes to inspire community connections this winter and invites passersby to use this sculpture as a way to share the warmth of the holiday season with friends and followers.